Tiny in terms of land area, Costa Rica is astoundingly diverse when it comes to culture and natural attractions. In a country called "Rich Coast", it's no surprise most Costa Rica vacations dedicate at least a few days to picturesque Pacific and Caribbean beaches, ideal for water sports and relaxation. Few small countries offer such a range of landscapes, allowing tourists to observe towering volcanoes while soaking away their worries in a hot spring, or hike into dense rainforests in the morning and surf at a modern resort in the afternoon. A trip to Costa Rica also lets you discover pristine national parks, ensuring plenty of chances to view wildlife from the comfort of eco-friendly lodges packed with amenities even ardent nature lovers secretly desire. Costa Rica is in Central America. 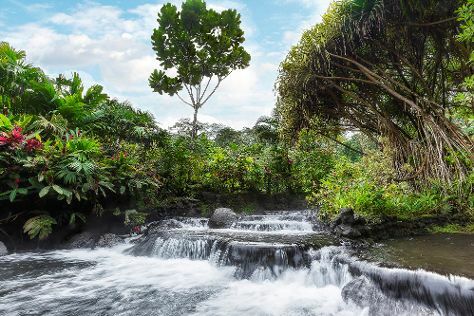 Put Costa Rica at the heart of your travel plans by using our Costa Rica trip planner.